From what sources, if not from abroad? 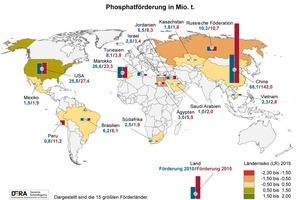 In line with the federal German government‘s sustainability strategy, and in view of the 2017 amendment to the Sewage Sludge Ordinance, new importance now attaches to the recycling of phosphorus-containing waste and, above all, to sewage-treatment sludges and sewage sludge ash. There has, in the past, also been no lack of attempts at recovering phosphorus from these waste types. Their aim, in most cases, has been the obtainment as a recycling product of a fertiliser for agricultural use, in other cases, the necessary process cost-efficiency still remains to be attained. 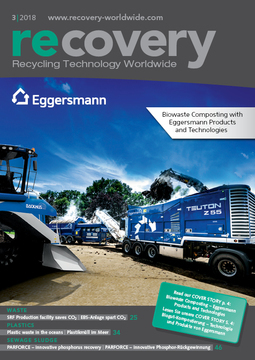 This article focuses on an innovative process which generates diversely useable phosphoric acid as a recycling product and can be operated cost-efficiently. Proof of this has been furnished using a small-scale demonstration plant. 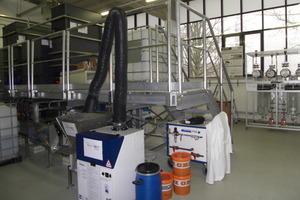 Such a recycling plant can be constructed at sewage-treatment facilities and is recommended by its operators for high-grade recycling of their waste. Phosphorus and phosphates number among the so-called strategic material resources – the Commission of the EU added phosphorite to the list of twenty critical feed resources in the European Union as long ago as 2014, and demand has already increased enormously due, even alone, to the drastic rise in the global population. Deposits are found in only a few countries: around 80 % of world reserves are located in Morocco, Western Sahara, China, South Africa and Jordan, as is also demonstrated by the latest figures published by the Federal Institute for Geosciences and Natural Resources (Fig. 1). Production remains concentrated in, above all, China, the USA, Morocco and Tunisia; Europe possesses effectively no reserves of its own (Fig. 2). During the past decade, China has overtaken the USA and Morocco, the previous largest producers of phosphorite, simultaneously raising its market share of total mined production to 56 % in 2016 . Life would be inconceivable without phosphorus: no plant can grow, and no human being remain alive, without this element. The human body contains an average of 0.7 kg of phosphorus, which it obtains from foodstuffs. This phosphorus can be found, primarily, in the form of hydroxylapatite – Ca5[OH(PO4)3] – in the bones and the teeth, and also in human genetic material, the blood, and in human tissue. Nowadays, 90 % of global phosphorus production is used for the making of fertilisers (global production of phosphate fertilisers: 42 million t/a) , the more so, in view of the great expansion of its potential applications arising from the cultivation of bio-fuel crops. Further applications, such as the production of steel and other alloys, pesticides, foodstuffs and animal feeds, flame-retardant additives and numerous other special products, for example, also remain important, however . 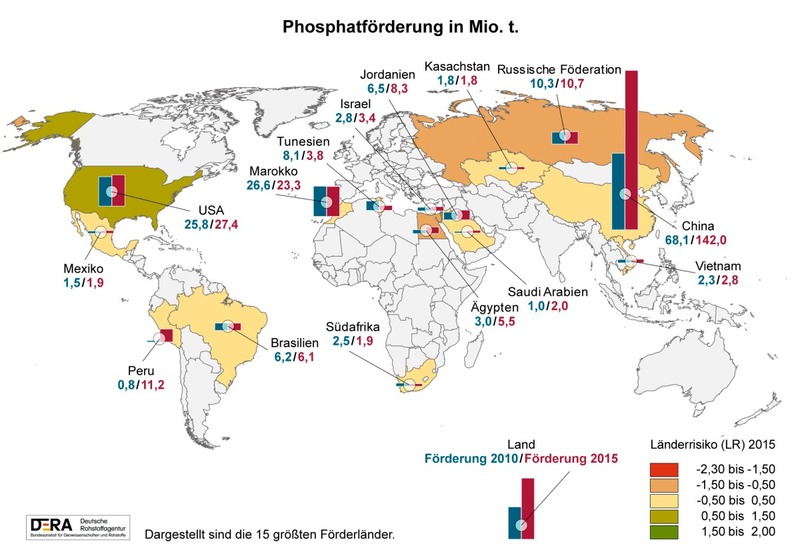 Germany currently imports a total of 530 000 t of phosphorus annually, of which around 63 % is used for fertilisers, approx. 20 % for animal feeds and around 6 % in human foodstuffs [4, 5]. The static lifetime of phosphate reserves is at present stated to be approx. 300 years [6, 7]. 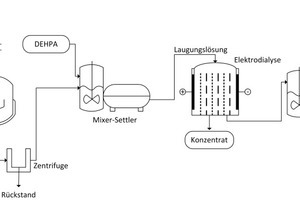 The recovery of pure phosphoric acid from sewage-treatment sludge and other phosphate-containing waste – as implemented in the PARFORCE process – for specific applications is significantly more advantageous than merely again producing a fertiliser. In addition, the corresponding phosphorus recyclates are also dependent on approval under the Fertiliser Ordinance and on market acceptance. Germany‘s around 10 000 municipal sewage-treatment plants yield around 2 million t of sewage-treatment sludge (dry substance) each year . There is thus a significant resources potential here, especially in view of the aim of eliminating dependency on in some cases geopolitically unstable countries for imports and of the fact that the quality of existing deposits is declining and that these are increasingly contaminated with impurities, such as cadmium and uranium and its nuclides [6, 7]. The utilisation of sewage-treatment sludge and other phosphorus-containing waste as sources of feed materials is in line with the federal government‘s legal stipulations in the Closed Substance Cycle and Waste Management Act, and also with corresponding EU directives. The spreading of untreated sewage-treatment sludges as fertilisers on agricultural land was perfectly permissible, under certain conditions, until 2016, but stricter controls have applied since 2017. The agricultural use of sewage-treatment sludge and sewage sludge ash is now subject to certain legal limits, which will become even more stringent in the future in the wake of the amendment to the Sewage Sludge Ordinance (AbfKlärV) and the Fertiliser Ordinance (DüMV). 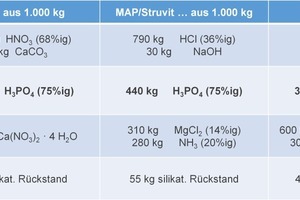 The AbfKlärV passed by the federal council on 17 May 2017 requires a reduction in soil-related use of treatment sludges and imposes an obligation to recycling of phosphorus for sewage-treatment plants (STPs) of ≥ 100 000 PE as from 2029, and for STPs ≥ 50 000 PE from 2032, with no restrictions on selection of the recycling process implemented (Fig. 3). Sewage-treatment plant operators are thus required to explore corresponding recycling methods in good time. Innovative processes which can be applied on-site at the treatment plant, thus saving transportation costs and quite possibly generating sales revenue, will therefore be preferred. Plants designed for less than 50 000 inhabitants will continue to be permitted to use municipal sewage-treatment sludges directly for fertilising purposes. This takes account of the special circumstances of predominantly rural regions. Legal quality-assurance provisions with flanking support from official supervision will be created for this purpose, however. The imposition of limits on uranium and other heavy metals is currently under discussion . The aim of the amendment is that of recovering phosphorus directly from sewage-treatment sludge, from sewage sludge ash, or from the waste-water. There are exceptions for treatment sludges with extremely low P contents, but these are, of course, anyway less relevant in the context of the recovery of phosphorus. The recycling processes developed up to now for the recovery of phosphorus are essentially based on the utilisation of sewage-treatment sludge or sewage sludge ash as a secondary source of phosphates. The phosphate content here originates, for example, from domestic and industrial waste-water, and also from detergents and pharmaceutical byproducts. 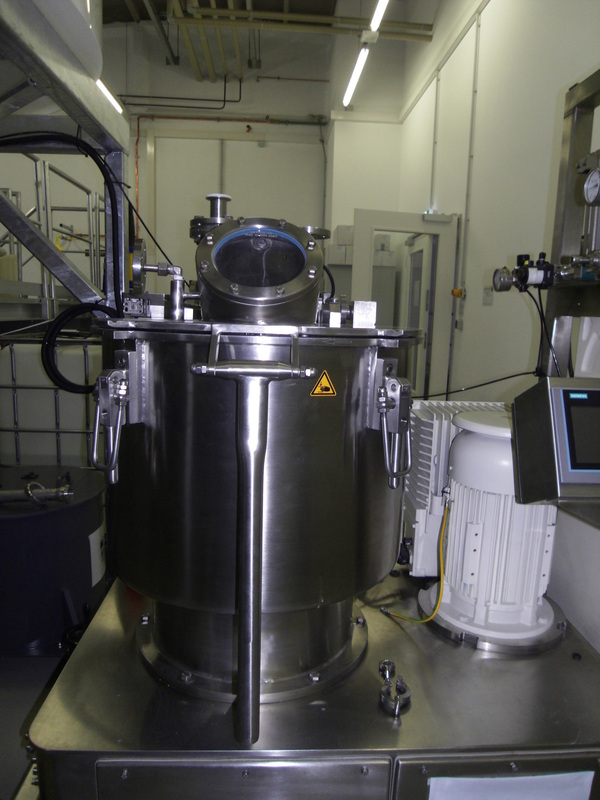 Around fifty different processes had been developed on a laboratory scale for this purpose by 2015, but only few have been tested on a semi-commercial or pilot scale . A comprehensive overview of the corresponding processes in which removal of pollutants and/or the separation of recyclables and pollutants takes place, along with their technological implementation, is provided in [7 and 9], while an up-to-date overall view is shown in . The concepts for recovery of P are summarised, subdivided into various process groups, in Figure 4. 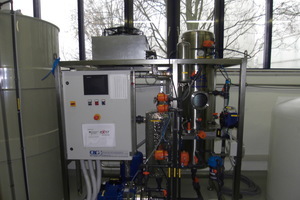 The Swiss have played a pioneering role in the P-recycling processes, having developed a range of methods, including the Ostara, Seaborn and Crystalactor processes  and commissioned, for example, in 2016 in the Canton of Zurich, a central sewage-sludge recycling plant at the Werdhölzli treatment plant with the aim of recovering phosphorus . 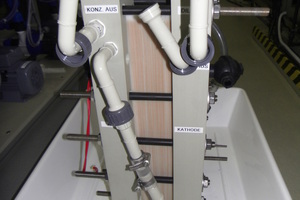 The incineration of municipal sewage-treatment sludge, as practised at Werdhölzli, generates an ash containing 10 to 20 % phosphate. This phosphate content fluctuates, however, and the ash is also contaminated with heavy metals . The result is that the removal of phosphate under these conditions is extremely complex. In addition, there is also a high yield of non-recyclable byproducts which can, at present, only be landfill dumped. In the processes developed up to now, technological and financial input and output are thus generally not in any cost-efficient balance. 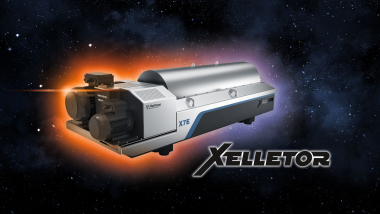 Many scientists currently perceive no potentials for processes not orientated around the recovery of fertilisers, such as bio-leaching, ion exchangers, magnetic separation and chemical digestion processes [e.g. 8]. There is, however, no lack of attempts at recovering, using the most greatly differing range of processes, useable polyvalent phosphoric acid or pure phosphates. In the TetraPhos process, for example, phosphoric acid is produced in a multi-stage process and the calcium precipitated out in the form of phosphogypsum, using sulphuric acid . SeraPlant, PRiL, PYREG and Extraphos may be mentioned as further recovery processes with development potential and based on ash chemistry . 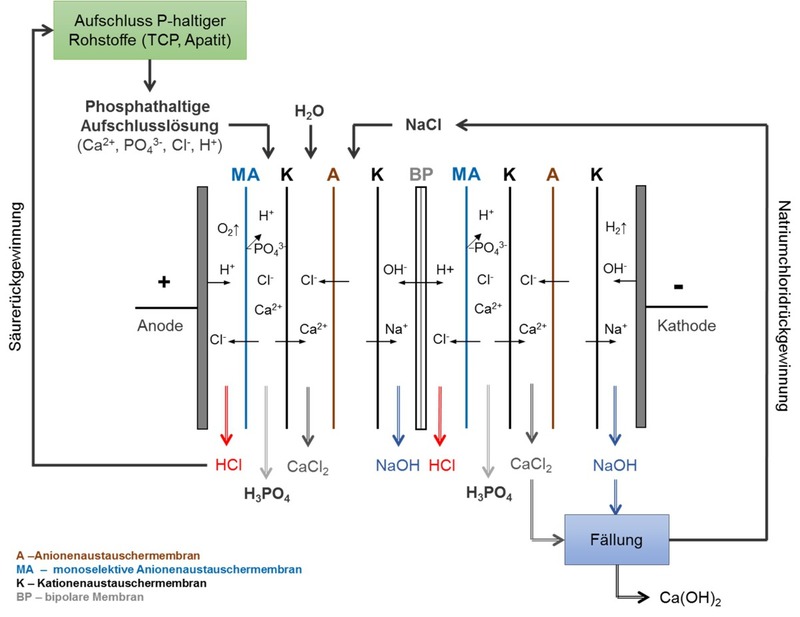 A process which generates pure, saleable calcium phosphate and, at the same time, „clean“ waste-water has been developed for the recovery of phosphorus from pharmaceuticals industry waste-water, which contains around 60 g/l phosphates . Although the major part of phosphorus recyclates will, in the future, continue to be produced for repeat agricultural utilisation, many experts are nonetheless of the opinion, against the background of a with certainty approaching scarcity of primary resources, that examination of the other potentials for the most complete possible reutilisation of the byproducts is worthwhile [e.g. 15]. Special importance therefore attaches to the PARFORCE process described below. This process is based on the concept of recovering basic resources using the principle of integrated production. This branch of science, referred to by Bertau et. al. as „recovery chemistry“, examines the totality of origin-independent processes and methods for the generation of basic chemical resources. The boundaries between primary, secondary and regenerative feed materials are eliminated, and the limits on availability of resources are shifted by means of holistic production technologies. Three patents [18 – 20], of which two have now been disclosed, have been filed for this process. All phosphorus-containing waste, provided it is present in solid or pasteous form, can, in principal, be used in the PARFORCE process. Bone ash from slaughterhouses (animal-meal ash), thanks to its high phosphates content (73 - 84 % calcium phosphate, 2 - 3 % magnesium phosphate), would be a particularly suitable feed material; its use is not permitted at present, on legal grounds. 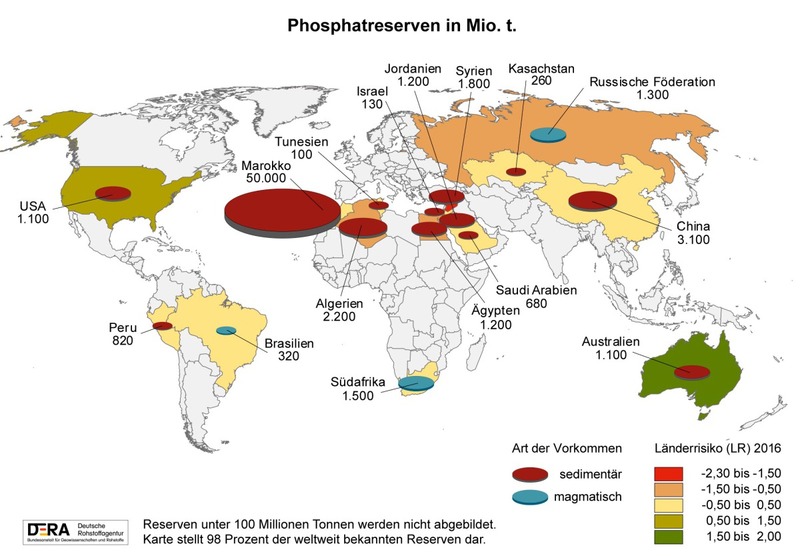 Phosphorus-containing industrial waste, including such from the foodstuffs, automotive and pharmaceuticals industries, such as magnesium ammonium phosphate (MAP, or struvite), or tri- and dicalciumphosphate byproducts (TCP/DCP) from sewage-treatment plants, phosphate-containing incineration residues and fly ashes, and also, in principle, apatite, and even luminescent material/substances (phosphors) from life-expired illuminants, can also be used. 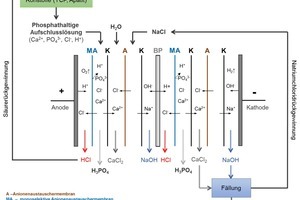 The benefits of the use of struvite can be found in the fact that this substance is, anyway, yielded in the sewage-treatment plant and that the treatment sludge is thus dephosphated, with the result that there is no obligation for its recycling under AbfKlärV. It can be assumed that, on a longer-term view, the use of sewage sludge ash and sewage-treatment sludges will (after appropriate pre-treatment) also be possible. 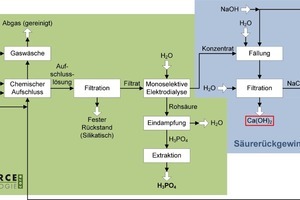 The digestion suspension is then filtered and the phosphoric acid in solution is separated out and concentrated by means of a membrane process (Fig. 6) . Any impurities in the feed flow are mainly retained in the silicate filter residue and cannot be rinsed out by water. This residue can therefore be used safely as an alkaline activated binder (geopolymer) in the construction industry; the permissible limits are met. It should also be noted that the crystallisation of MAP at present frequently results in problems and encrustations in the piping of very many sewage-treatment plants, with the result that it must either be removed at an early stage or attempts made to suppress it by means of chemical additives. Totally new potentials for the fulfilment of legal requirements arise when the removal of MAP is examined on the criterion of the recovery of P, however. 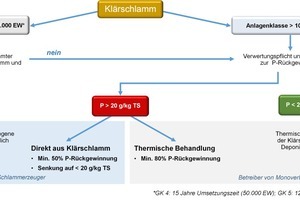 In the „expanded“ PARFORCE concept, use is made of MAP crystallisation and optimisation of the technology implemented to assure meeting with certainty of the legally imposed limit of 20 g P/kg TS. This offers the decisive advantage that the treatment sludge yielded after mechanical dewatering is no longer subject to any requirement for recovery. Its disposal in a mono-incineration plant is therefore no longer mandatory, and the treatment-plant operator thus has strategic freedom of manoeuvre in selection of the disposal method. It is then possible either to continue using the previous disposal route, or to utilise the sewage-treatment sludge in co-incineration plants and in coal-fired or cement-plant power stations. 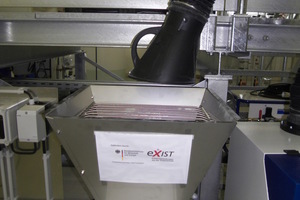 This process component can be used with all the above-mentioned feed materials. The hydrochloric acid used as a digesting acid, for example, is then recovered by means of electrodialysis and is recirculated (Fig. 7). Lime, which can be used, for example, as a precipitant in waste-water treatment, is produced in addition to phosphoric acid. 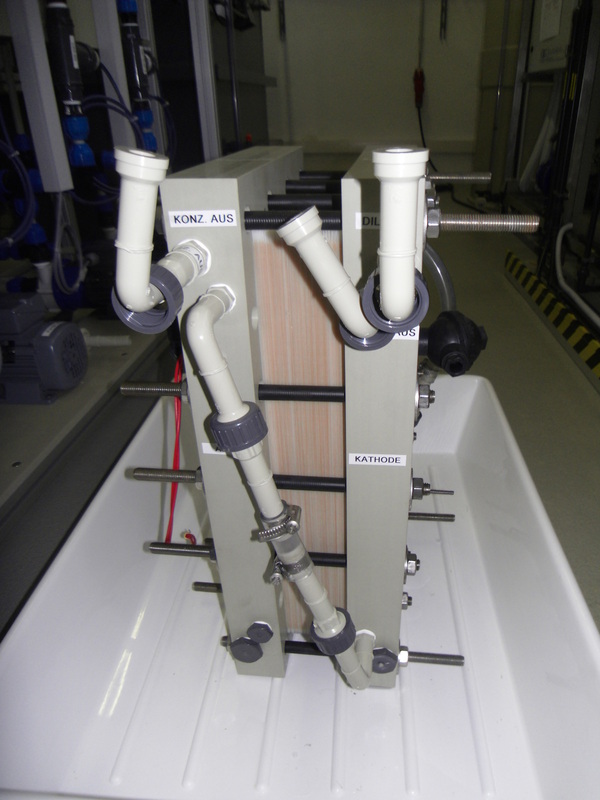 Electrodialysis is an extremely energy-intensive process, and the PARFORCE process with integrated acid recovery is therefore particularly recommendable for use in areas in which surplus, fluctuating and, above all, renewable energy is generated, from wind-power or photovoltaics systems, for example, for which there is no other, rational use, or which is generated at particularly low cost. The short start-up and shut-down times of the PARFORCE process also mean that it has extremely low requirements concerning continuous supply of energy. 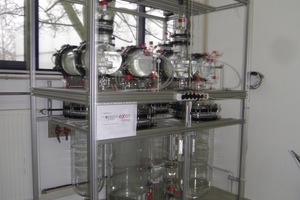 This additional process component is installed when nitric acid is used as the digesting acid (Fig. 8). 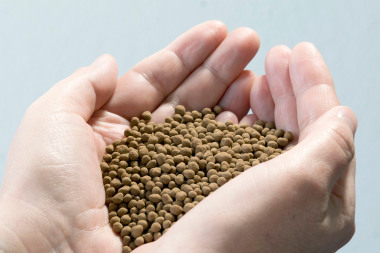 This results in calcium nitrate as a byproduct, which can be used as a basic feedstock in the production of high-quality fertilisers, in particular. This process variant also permits the use of all the above-mentioned primary and secondary resources as feed materials. 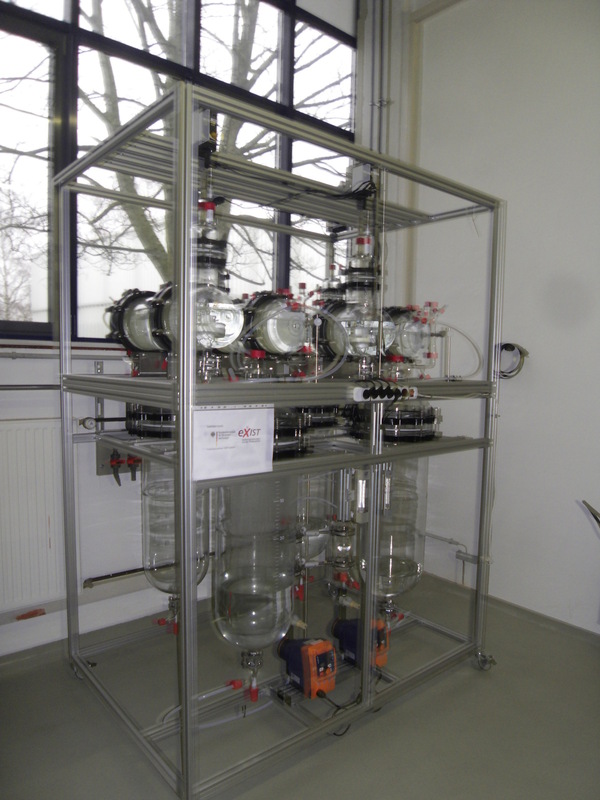 It has been possible, in addition to successful laboratory-scale and semi-commercial scale tests, in April 2017 to commence construction of a small-scale plant in a technology center building at the TU Bergakademie Freiberg University of Resources. 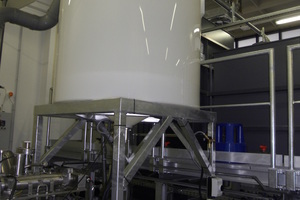 An essential precondition for this was the provision of funding by the Federal Ministry for Economic Affairs and Energy, which is supporting the construction of this demonstration plant with funds of around 1.02 million € for a term of two years via the „EXIST – Research Transfer“ funding programme. Additional funding of 0.26 million € has also been provided by the State Ministry for Science and Art of the German federal state of Saxony. This plant (part view: Fig. 15) is equipped with an extensive control and instrumentation (C&I) system, designed for a throughput of 1 t/d and is, above all, intended as a demonstration plant for potential operators. The plant passed its trial runs with flying colours, permitting its celebratory inauguration by federal economics minister Brigitte Zypries in October 2017. 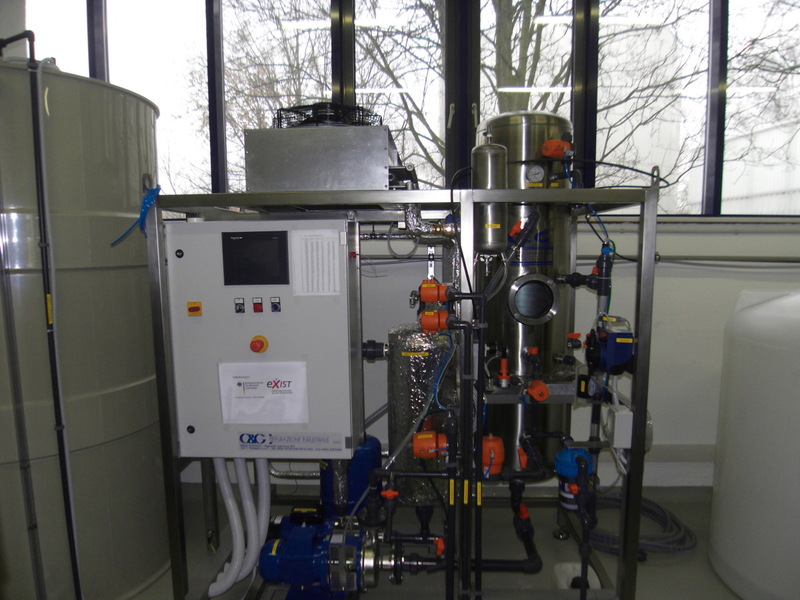 Commissioning by Saxony‘s environment minister, Thomas Schmidt, of the demonstration plant, in association with the founding of the necessary company (PARFORCE Engineering & Consulting GmbH) then followed in December 2017. 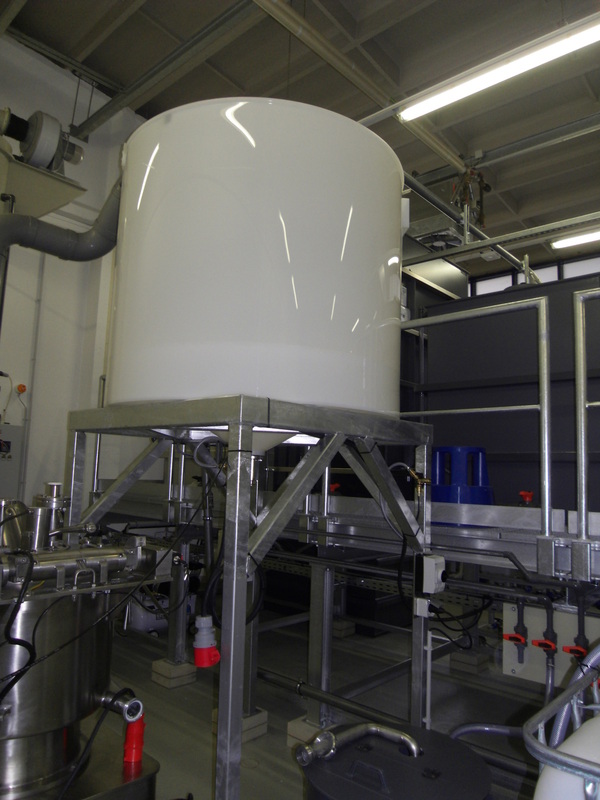 Total investment expenditure for this plant was around 500 000 €. 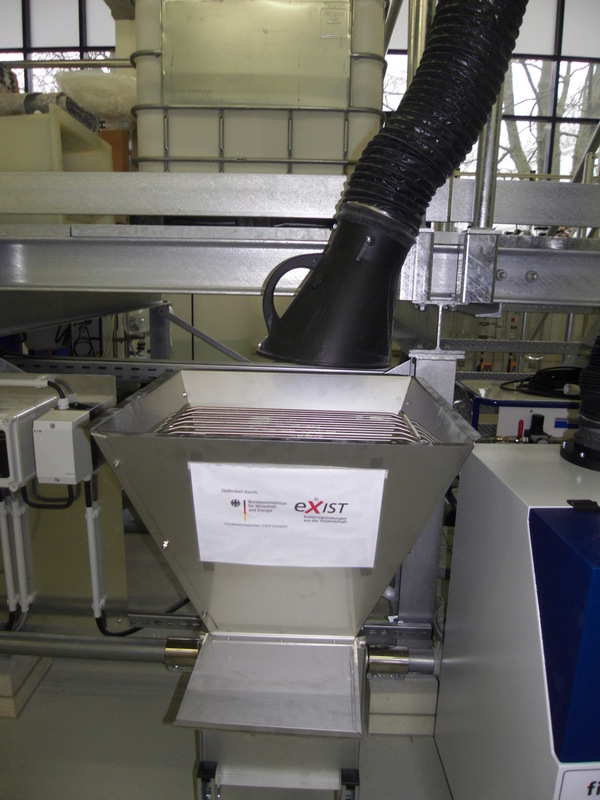 The plant was firstly test-operated using quantities of 50 to 100 kg feed material. The results obtained were extrapolated to 1 t of feed material and are summarised in Figure 16. We may firstly ascertain that no waste is produced. In addition to the target product – high-purity phosphoric acid – only other (by-)products of recycled status are generated, either immediately or after further processing. Yields are satisfactory. The process design for the demonstration plant permits derivation of initial data on its commercial practicability. Diverse specific investment costs result for the individual feed materials (Fig. 17). The starting point in this case is a sewage sludge ash with a P/Ca ratio of 9.3/18.7 (large blue dot) and a degree of P digestion of 90 %. The high rate of digestion in the PARFORCE process is the result of the legally stipulated recovery rate of 80 %. A significantly higher degree of digestion must be assumed, however, since losses always occur in chemical processes. 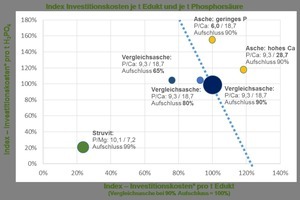 With a constant P/Ca ratio, the lower the degree of digestion, the lower the investment costs (smaller blue dots). The reason for this is the fact that individual plant components, such as electrodialysis and liquid-liquid extraction, can be designed smaller. The differences in investment costs for differing degrees of digestion are significantly lower compared to those for a falling phosphorus content or rising calcium content. A drop in phosphorus content in the sewage sludge ash from 9.3 % to 6 % causes a rise in investment costs per tonne of phosphoric acid produced of nearly 60 % (yellow dot). A similar pattern is apparent with constant phosphorus content but rising calcium content in the ash. If the latter increases from 18.7 % to 28.7 %, the investment costs per tonne of feed materials and also per tonne of phosphoric acid will rise simultaneously by 20 %. This is also the result of the necessary enlargement of individual plant components, such as electrodialysis, since it is then necessary to transport more calcium via the membranes. 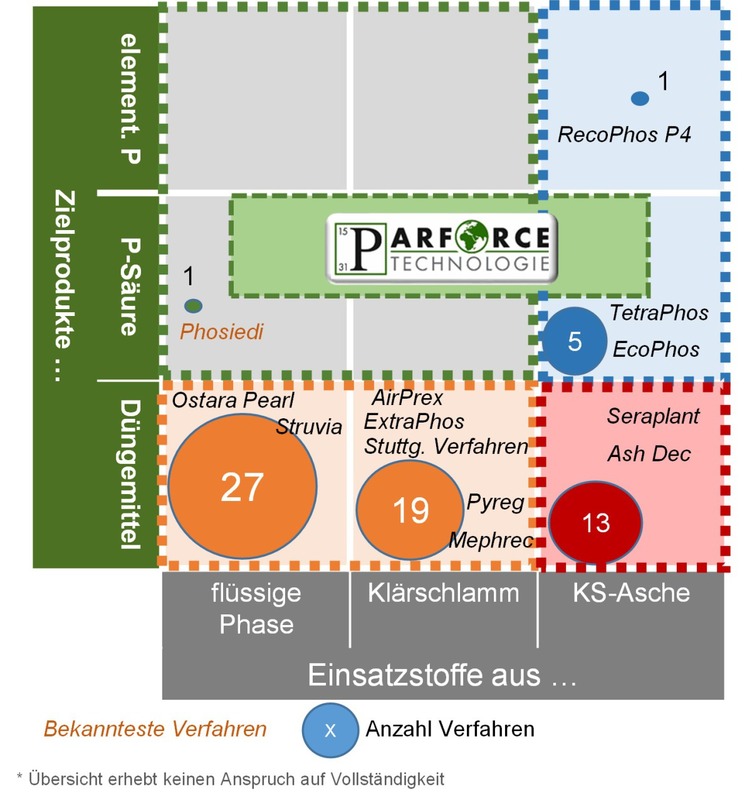 PARFORCE technology is, in general, also extremely well suited on economic criteria for the recovery of phosphorus from sewage sludge ash. As in all wet-chemical preparation processes, however, investment costs are heavily dependent on chemical composition, and fluctuations in this will automatically result in a significant rise in investment and in operating costs. The design of any corresponding processing plant must necessarily take account of these potential fluctuations, in order to meet the recovery rates stipulated in the AbfKlärV with certainty, and this fact necessarily results in greater technological input and complexity. A useful alternative is provided, on the other hand, by removal of phosphorus in the form of MAP/struvite as early as the sewage-treatment process (see Section 4.2 above). Not only the benefits already noted, but also the significantly lower investment costs compared to the processing of a sewage sludge ash, should also be mentioned (Fig. 17, green dot). The investment costs for upgrading of struvite using the PARFORCE process are around 20 % of those required for a sewage sludge ash. This difference is the result, primarily, of the constant chemical composition of MAP and of the high purity, since there are no subsidiary constituents with the exception of magnesium, ammonium and phosphates. 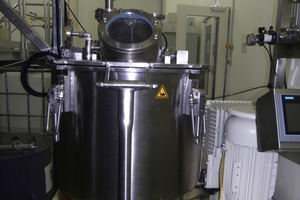 Additional high-cost processing stages can therefore also be omitted. 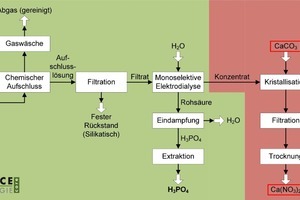 It has been possible, using various phosphorus-containing feed materials such as MAP/struvite, di- and tricalcium phosphate residues, apatite and sewage sludge ash to demonstrate that a technology has been developed which will make it possible to recover high-purity phosphoric acid from primary and secondary feed materials. This technology is designed to incorporate a range of different process variants and is thus flexibly utilisable. 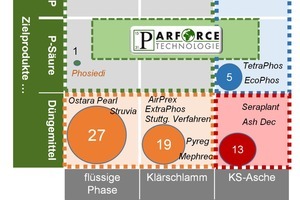 PARFORCE technology constitutes a practicable solution for sewage-treatment plants, particularly in view of the amended AbfKlärV, without the necessity for complex and costly treatment-sludge incineration. Founding of the spin-off described above has now been effected. 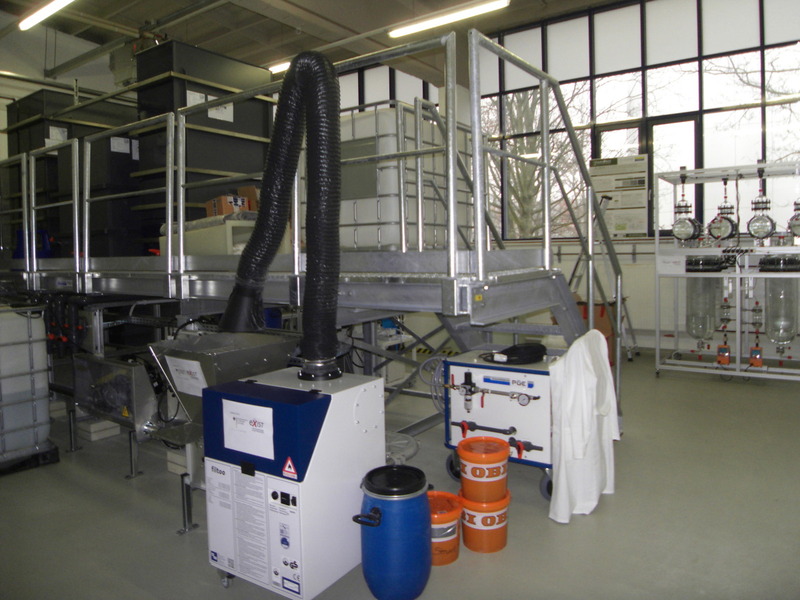 The newly founded PARFORCE Engineering & Consulting GmbH advises treatment-plant operators and disposal organisations, and also drafts concepts on the basis of practical testing in the demonstration plant, with the aim of acquiring potential customers. The main target is that of providing treatment-sludge disposal organisations with a long-term reliable solution for the implementation and meeting of the AbfKlärV. There are, in addition, currently ongoing negotiations with a local sewage-treatment plant for the construction of a pilot facility for side-stream treatment for implementation of the expanded PARFORCE concept. 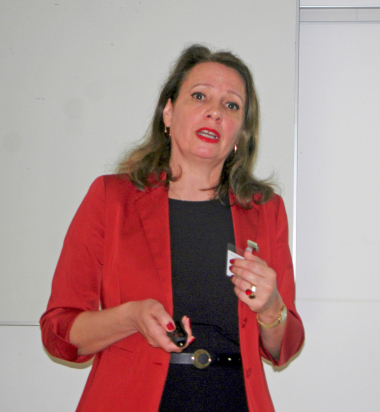 Recovery of phosphorus  potentials for a technical and commercial solution?